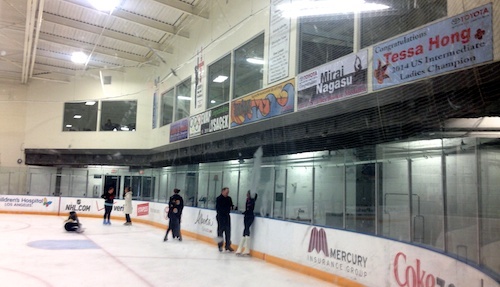 In LA I skated at the Toyota Sports Center with coach Gary and my friend Kate, mostly on a small ice surface called “the pond.” One of my lessons with Gary was on a different surface where Frank Carroll works with his elite skaters. We kept out of their way. Later I thought I would walk back over to absorb the scene before this coach of many champions retires, as he will at the end of this season. One of Frank’s students was learning a triple loop and Frank padded onto the ice in his shoes time and again to demonstrate and instruct. 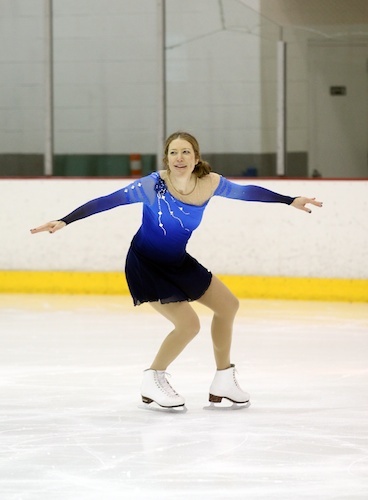 Back at “the pond” Kate tried to help me out by finding a coach to help me out with my second skate at Sectionals. She knew coach Gary wouldn’t be able to stay for it and that I prefer having a coach to keep me relaxed, organized, and on time. Richard said he wouldn’t be attending Sectionals on that day but we had a nice chat. He understood my concern and told the tale of when he was chosen by US Figure Skating for an international competition and his coach couldn’t come along. The competition was in France during the same week that his coach was taking all of his skaters to Sun Valley. Richard felt disappointed since he had never been to Sun Valley and really wanted to go. But on the other hand he felt he should take his chance to go to France. He’d never traveled abroad, though, so it was not easy to travel there and compete on his own. He said he would get my number from Kate if he ended up coming to Sectionals on that day. After I finished skating my husband and I packed up and drove from LA to Pasadena where Sectionals was being held. On my competition morning I nervously did my swing-era hairstyle for the first time. Luckily it was a lot easier than I thought it might be. I walked over to the rink for my practice ice. They played each skater’s music in turn, but not mine. Near the end of the session I spoke to an official who said that I must have signed up for unofficial practice ice, which doesn’t have music played. I later found out that only the higher-level competitors were counted as having “official practice ice.” That certainly wasn’t clear. Despite that annoyance, I’d had a decent practice even without hearing my music. A few hours later Gary put me on for my light entertainment program. I focused on smiling and being energetic in my program and did pretty well on that. I touched down on my double twizzle but overall I was pretty happy. My placement was fifth out of five, with higher ordinals from some judges. I didn’t love that, but it’s light entertainment, it wasn’t a big deal. I watched video of my program and I was able to see that at certain points my shoulders were up and at others I had wimpy arm extension. Those were two things I wanted to fix, so I practiced my arm movements in front of the mirror in my hotel room. 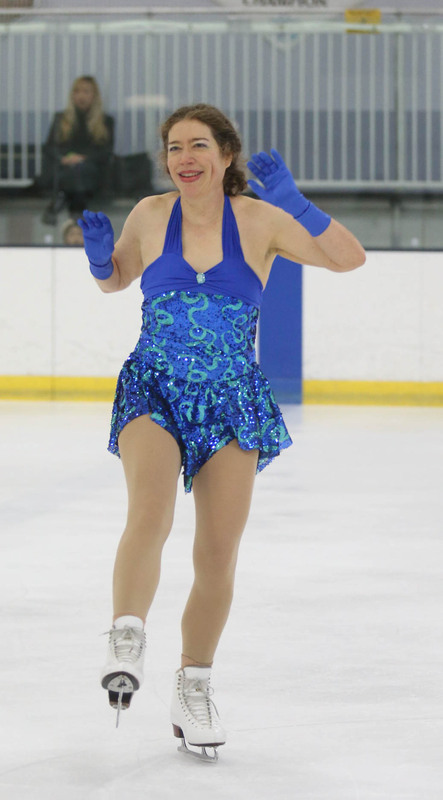 I’m using the same program for both light entertainment and solo free dance so I’d be skating it again later that day. While I was doing my makeup and hair for the second time I got a call from Richard. He’d decided to come and watch the gold ladies skate and figured that as long as he was doing that he should “help out that lady Mary.” He gave me a couple of updates on the typically heavy LA traffic en route and arrived at the perfect time to help, about an hour before my skate. We had a quiet, relaxed time chatting and warming up. I told him my goals were to for my arm movements to be bigger and to enjoy my skate. It’s a fun program, so looking nervous and grim while performing is especially unsuitable (as well as being no fun). I was able to relax pretty well with Richard’s help. After my skate he asked me whether I had had fun and I was able to say yes. He didn’t want any payment from me, he just wanted to be of service. What a nice guy. I’m glad to have started to get to know him. I only had one competitor in my solo free dance event and I came in second to him. He’s quite a good skater and over a decade younger than me so I was reasonably OK with that. We took some goofy medal stand photos together. As I was walking around after my program I saw pairs world champion Randy Gardner and acknowledged him with a smile. He said, “Hey, I saw your program, it was really fun! You were moving, you were grooving!” It made me feel really good that my program had gotten his attention. An exciting end to my day at the rink! Pacific Coast Adult Sectionals: Part I Last minute preparations and struggles getting ready for Adult Sectionals in Ontario, CA. My skate at Pacific Coast Adult Sectionals Skating at my first big competition, the Pacific Coast Adult Sectionals. 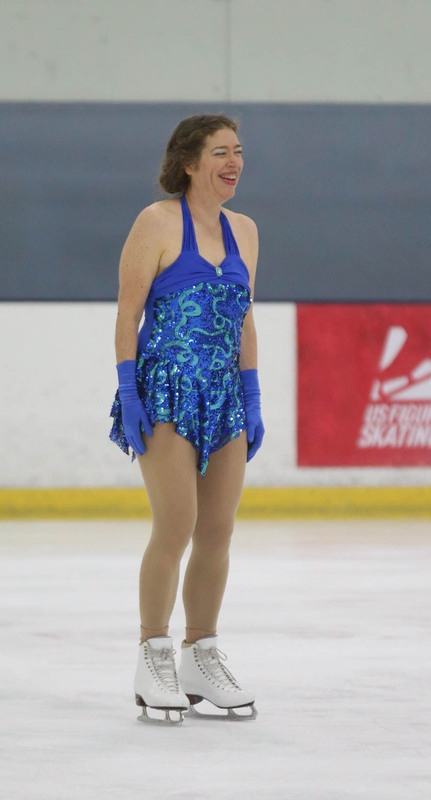 Pacific Coast Adult Sectionals: Part II My skate at 2014 Pacific Coast Adult Sectionals. Skating: Watching, Performing, Testing Getting ready for Sectionals and my juvenile moves test. Really fun and peppy dance, Mary! I can see how much the arm movements make a difference, particularly with those great blue gloves on. And I really like the color of your dress and the sparkle (just the right amount!) So enjoyed watching as well as hearing about your program! 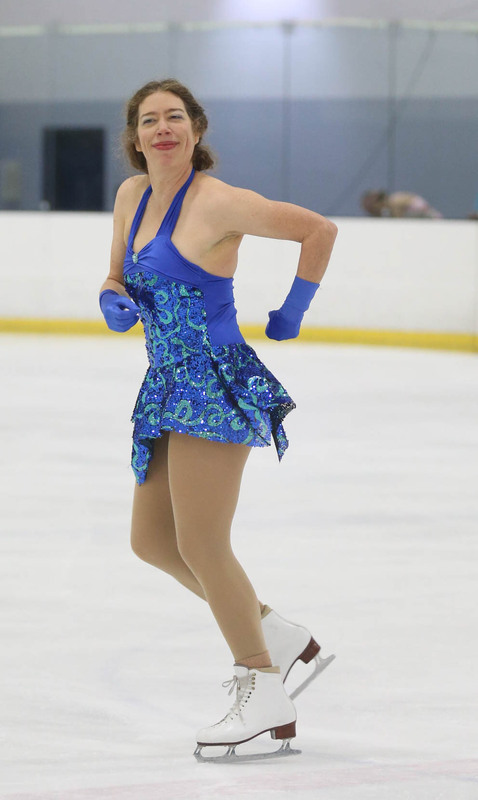 Gorgeous dress and a fantastic skate, Mary! You really look like you are enjoying yourself out there! Wish I could come cheer you on at AN. Thanks Eva! Maybe we will see each other at AN next year. Congratulations Mary! What a fun program and I love your dress. How cool to be acknowledged by Randy Gardner! Thanks Marcia! That was definitely a highlight! Super cute! I love your program!! And what a great way to end the day! Congrats, girl! Congratulations! Sounds like it was a fantastic and successful day for you. Thanks Kim! Everyone tells me that about the music, I’m so glad I picked it. Kimberly Hatting recently posted..Well, hello April! What’s Happening? Oh thanks! 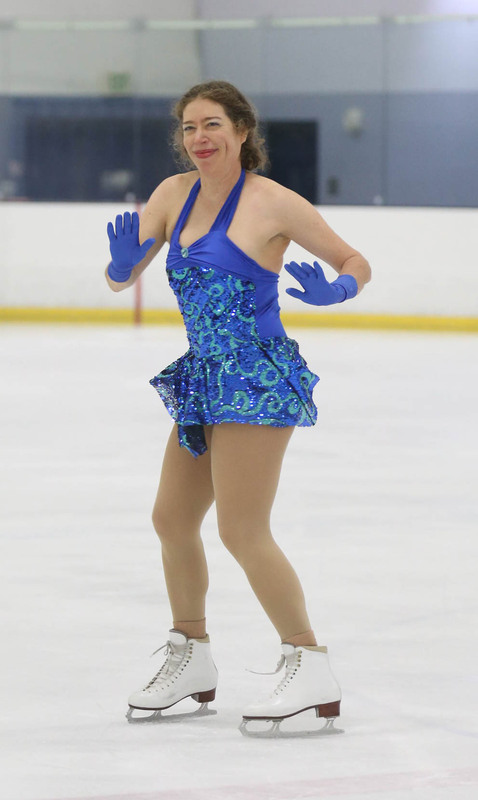 I was lucky to find that dress just two days before I skated in it. Check out my previous post if you want to hear about that! You are so incredibly brave and talented! I can barely skate one time around a rink with both feet on the ground, let alone in a cute skirt! Congratulations on a wonderful competition! I’m sure it soothed your nerves to have Richard there in the end. Thanks so much Jenn! It was really helpful to have Richard help me out. I don’t have anyone to help me at my competition next week, I hope I can connect with someone there! Thank you Stephanie. Give the ice a try some time. Even with your varied fitness activities I think you will find that skating is different from anything else you’ve ever done. Omg I love it!!! I think you did so great even despite a few annoyances or disappointments. By the way, that blue on you is AMAZING! Oh thanks Renée! I’m glad you liked the program and the dress! What a fun routine and I love your costume! Congrats! How do you practice your routine without music? That would be so hard! Thank you Wendy! I practice my routine without music all the time. It’s not possible to monopolize the rink sound system with my music. But yeah, you really need the music to get the timing of everything right, especially at a new rink which probably is a different size. I don’t know any other sport where the “field” is not, for the most part, a standard size. What a fun program! Love the little jive moves! Looks like you had fun and kept on smiling! Thanks Esther! And I enjoyed reading your blog, it looks like you are using your blog in a meaningful way toward a lot of your goals.